Many many years ago when I lived and taught in the industrial town of Szolnok, Hungary. Someone wrote a very large bit of graffiti across the bottom of our tower-block. In big, white letters, at least a foot high, the artist wrote ‘I’m still love you’. Ever since then, I’ve been on the look out for incorrect English in graffiti, something with isn’t confined to places that don’t speak English as their first language. 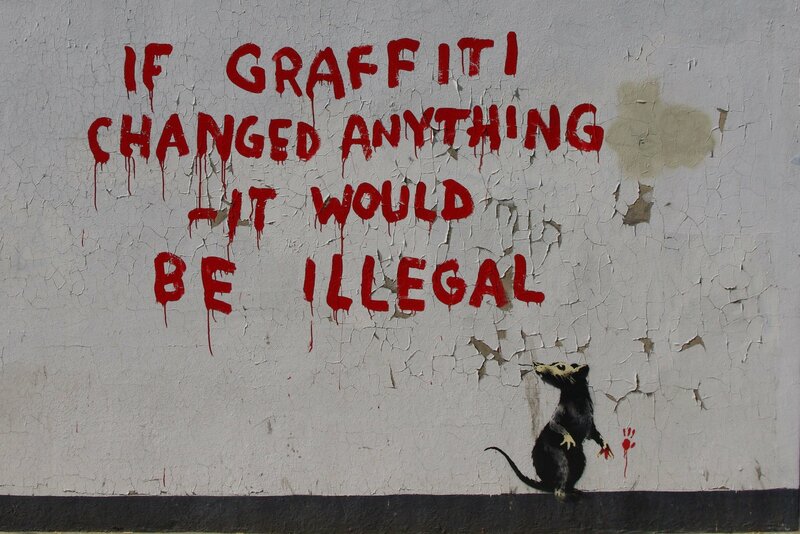 I’d highly recommend his website http://www.banksy.co.uk/ and his book ‘Wall and Piece’. Instructions on how to run the lesson are below. 1. Before you start ask students what they think about graffiti in general, do they think it’s art or just vandalism? You might like to talk about any specific bits of graffiti you all know about. 2. Put students into groups or pairs and show them the slide show. Get them to discuss the following questions for each picture. Describe the picture to each other? Is there anything strange about the picture? What? 3. When students have seen and discussed all the pictures, go through them again and elict any interesting information from the students. Lots of the pictures ARE political and need quite a lot of explaining. Next Quarrel – A first rate educational game that almost never got made.